Aerator attachment for a tractor, mower or ATV with a standard draw bar or cat. 1 3pt hitch/implement hook up. At up to 4 acres per hour the AET60 Aerator is ideal for medium/large Residential lawns as well as commercial,sport turf, park or large estate applications. 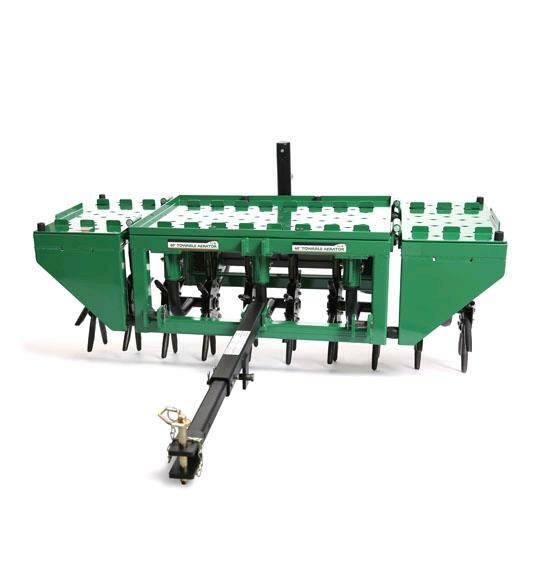 Flexible aeration widths of 36",48" or 60" with simple flip up/down of the aerators wings. Unit weight is 440 lbs and features a flat top deck for adding weight to increase penetration in hard soil. Provides a 6"x7" aeration pattern up to 4" deep. Recommended for 15hp min @ 48" or 20hp @60" ATV, riding mower or tractor towing. Aerate at least once annually in the spring or fall to improve root depth as well as air, water, fertilizer and nutrient flow for thick healthy drought resistant turf. Treat moss/ weeds 1-3 weeks prior to using aerator and thatcher. Rake up loose materiel and backfill aeration holes with sand, top soil, planting mix or steer mulch to further reduce compaction and increase drainage. * Please call us for any questions on our aerator 36 48 60 inch draw bar or 3pt rentals in Portland OR, Gresham OR, Milwaukee OR, and surrounding metro area.